A Definitive Lexicon of Linear B? Is this even remotely possible? A Definitive Lexicon of Linear B? Is this even remotely possible? Lest anyone suppose that even this first step towards constructing a Definitive Lexicon of Linear B, or even anything approaching it, is “obviously a cinch”, allow me to disenchant yourselves of such an assumption, as can clearly be confirmed from the several tenets I am bound to observe, which I have expostulated in detail below. This of course necessarily implies that even the apparently “simple” step of reliably verifying the authenticity of Attributed Absolute (Aab) Mycenaean words is open to all sorts of pitfalls. It is for this highly germane reason that I find myself insisting on checking and if needs be, double-checking the incidence of Attributed Absolute Mycenaean words according to the strict procedure I shall outline beneath the actual Table of Attributed Absolute Mycenaean Vocabulary. See below. But what on earth is the distinction between “Attributed Absolute” as opposed to merely “Attributed” Mycenaean vocabulary actually found on the thousands of extant Linear B tablets? The distinction is subtle yet, from a linguistic perspective, demonstrable, and it is this: any “Attributed Absolute” (Aab) Mycenaean word must be spelled (almost) the same as its alphabetical Greek dialectical counterpart to warrant this label. Unfortunately, the spelling of the vast majority of Attributed Mycenaean words either diverges somewhat or greatly from that of any relevant ancient Greek dialect as to make the correlation all that more difficult. And this of course all comes back to one of the most glaring characteristics of the Linear B syllabary, namely, that its syllabograms rarely correspond accurately to any alphabetical ancient Greek dialect, with the result that one sometimes cannot be sure at all whether the Linear B spelling of the Mycenaean word, even when Attributed, corresponds to only one Greek word, or in some cases, to 2 or even more possible alternatives. Some, though certainly not all, of the Linear B syllabary is rather poorly suited to writing ancient Greek, for the simple reason that it was adapted practically lock stock and barrel from the Linear A syllabary, which was used to (almost certainly accurately) represent the vocalic values of an unknown, undeciphered language, conveniently labeled “Minoan”, which simply has no relationship whatsoever to Greek (as far as we know). That is one big problem... much more on this later. 5. Any vocabulary from Liddell and Scott's Greek-English Lexicon (1986 edition), since Liddell & Scott takes into account many dialectal variants of ancient Greek words, including Aeolic, Arcadian etc, except of course the Mycenaean and Arcado-Cypriot Greek dialects, since texts in these 2 dialects are written in Linear B & Linear C, cousin syllabaries, which an alphabetical Greek dictionary, however  comprehensive, cannot take into account. 6 Any text written in any East Greek dialect of ancient Greek, especially the Ionic and Attic Dialects, which are the tried and true descendants of Mycenaean and/or Arcado-Cypriot Greek. There is so much literature in Ionic and Attic Greek as to make this task an extremely easy one. However, I must remind you that vocabulary in Ionic or Attic Greek is (sometimes significantly) less reliable than vocabulary in either the Mycenaean or Arcado-Cypriot Greek dialects, as the latter are far more ancient than the former. In other words, given  the choice of sources for truly reliable confirmation that any Attributed Absolute word(s), ie vocabulary actually found on Linear B tablets is in fact almost beyond a shadow of a doubt as close to absolutely authenticated, we should have far more confidence in options 1 to 4 above than in any vocabulary in Ionic or Attic Greek, for which there abound tens of thousands of examples. Any attempt to verify the authenticity of any Mycenaean Greek Attributed vocabulary or word from any West Greek dialect, is almost certainly invalid, since all West Greek dialects (Doric itself, Northwest Greek, Argolic, Corinthian, Rhodian, Cretan etc. etc.) are cousins of the Doric dialect, which did not enter into the equation until after the fall of Mycenae around 1200 BCE. I do not categorically rule out the possibility that some attributed Mycenaean words might be derived from one of the West Greek dialects, but I myself will never resort to using any of these dialects as firm confirmation of the authenticity of any attributed Mycenaean Greek word, since that would simply invalidate my procedure, which I am not prepared to do. On a final note, the Attributed Absolute Mycenaean words as derived here from the MYCENAEAN (Linear B) — ENGLISH  Glossary are far from constituting a complete survey, since they do not take into account the much larger vocabulary in the significantly more reliable, A Companion to Linear B, Mycenaean Greek Texts and their World (Bibliothèque des cahiers de l'Insitut Louvain), also available in .pdf format on the Internet. 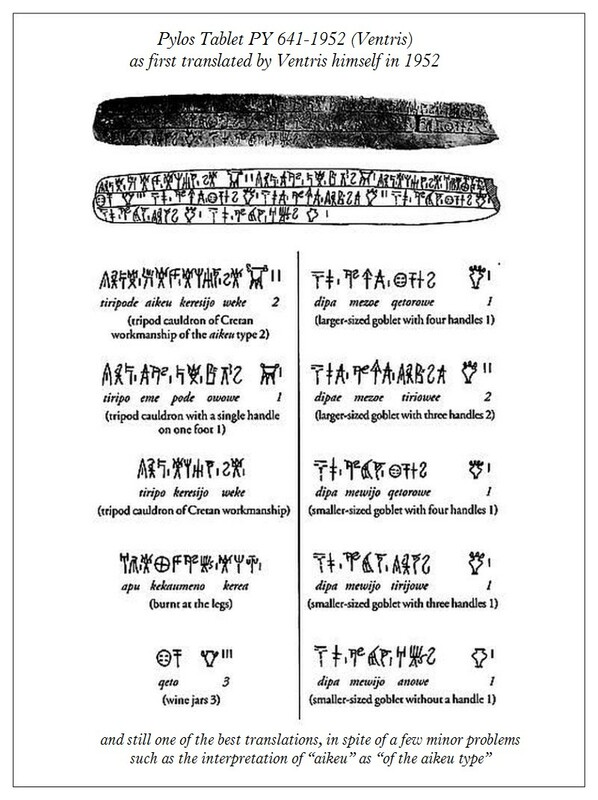 It will take me considerably more time to ferret out the Attributed Absolute Mycenaean Linear B words from that magnum opus, which is 220 pages long! Only when I have compiled a complete list of  Attributed Absolute Mycenaean Linear B words from both of these sources will we have even begun to construct a truly comprehensive Lexicon of the Mycenaean Linear B Vocabulary, both attested and derived. Such a Lexicon is bound to run to at least 5,000 words, a vast improvement on the vocabulary in any currently available Mycenaean Linear B – English glossary. 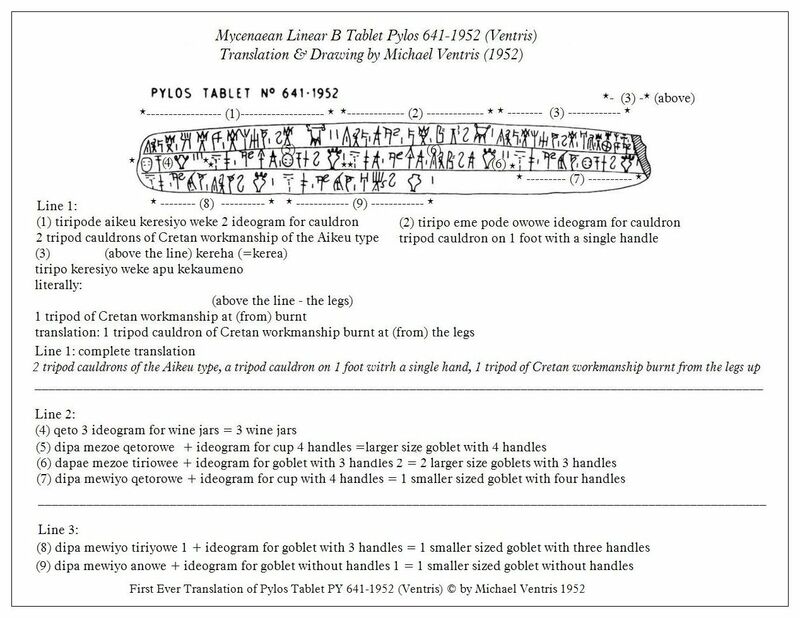 Moreover, our Lexicon of the Mycenaean Linear B Vocabulary will catalogue the vocabulary in two sections, Mycenaean Linear B – English & English – Mycenaean Linear B, a project the likes of which has never been attempted to date. I intend to rectify this lacuna, but this is a huge undertaking, which is bound to take me at least 2 years. since this task is to be realized in conjunction with the equally daunting exercise of reconstructing as much of the (lost) corpus of Mycenaean Greek grammar as I possibly can. All this together is bound to take me as long as 3-4 years, i.e. until 2018. The next post on this subject will deal with “Attributed Contextual” (Aco) Mycenaean vocabulary, which is almost as reliable as  “Attributed Absolute” (Aab) vocabulary.